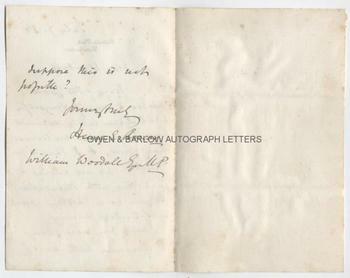 SIR HENRY ROSCOE Autograph Letter Signed. ALS. 2pp and integral blank leaf. Victoria Park, Manchester. July 7th 1884. 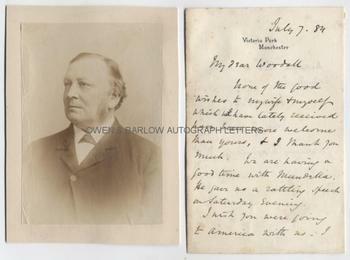 To William Woodall. Together with a fine contemporary portrait photograph. "None of the good wishes to my wife and myself which we have lately received have been more welcome than yours, and I thank you much. We are having a good time with Mundella. He gave us a rattling speech on Saturday evening. I wish you were going to America with us. I suppose this is not possible?" 8vo. Approx 7 x 4.5 inches. Mounting traces to verso of integral blank leaf, else fine. 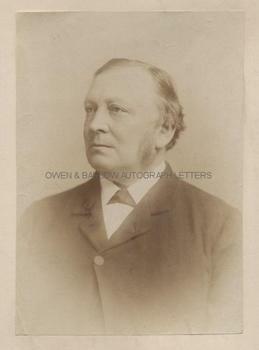 The portrait of Sir Henry Roscoe is a contemporary 19th century gelatin silver print photograph. It measures approx 5.75 x 4 inches and is laid down on card from album leaf. It shows Henry Roscoe head and shoulders in vignette, looking to his right. 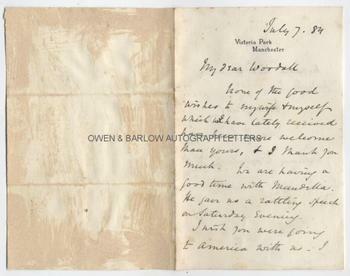 There are mounting traces to verso of mount but the photograph is in fine condition. Henry Enfield Roscoe, the uncle of Beatrix Potter, is most noted for the scientific research he carried out with Bunsen which laid the foundations of comparative photochemistry. He also carried out early and important work on Vanadium and its compounds and the element Roscoelite is named after him. He sat on several Royal Commissions, including the groundbreaking Secondary and Technical Education Commissions (1881-1884). His fellow commissioners included William Woodall, Sir Swire Smith and Philip Magnus. Henry Roscoe was very keen that chemists should receive proper training at British Universities and Roscoe, himself, became vice-chancellor of the University of London in 1892. Anthony John Mundella served as the Vice-President of Gladstone's Committee on Education from 1880 to 1885 (he was later President of the Board of Trade).